The Ryanair delay and the rude welcome by the Irish custom officer were easily forgotten as I was driving through Dublin’s centre. Since I was staying at a friend’s house outside the city centre, near Phoenix Park, I thus had the chance to experience the lesser known areas. My first impression of Dublin was: raw. London with a rough edge. 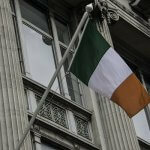 Where London is posh, Dublin is blue collar. My friend’s apartment was near the train tracks and while I was standing on his balcony admiring the view ‘industry chic’ came to mind. 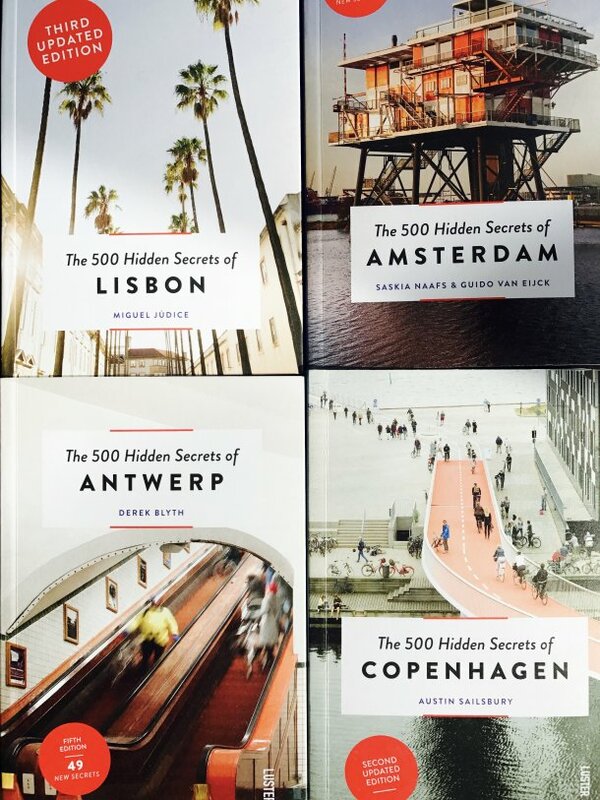 That does not make Dublin a less beautiful city! On the contrary; I loved the combination of stately, grey historical buildings alternated with bright and colourful constructions. 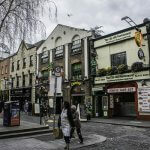 If you want to experience the Irish friendliness and vibrancy, you should start with a walk through Temple Bar, which is the city’s cultural heart. With all of its pubs the area is the ideal introduction to Dublin: you can enjoy the fun and ‘coziness’ both inside at the bar or outside on the street. 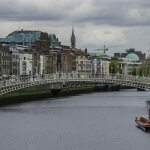 Since my friend sometimes experiences an allergy for tourist places, he quickly guided me through the masses over the Ha’penny Bridge to O’Connell Street. 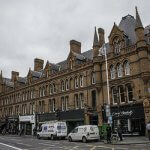 Even though it is a fast food boulevard with mostly souvenir shops, there are some impressive and historical relevant buildings: O’Connell Street has also been the place of many revolts in the Irish struggle for independence, such as the 1916 Easter Rising. Since I had been binging on Downton Abbey before my trip, I was somehow more aware of the importance of the issue. The General Post Office served as headquarters for the leaders of the 1916 uprising and, therefore, has an interesting exhibition with details on its role in the Irish independence. You can also buy magnificent stamps; they are a perfect collector’s item. 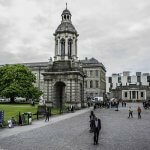 The best way to start your exploration of Dublin on foot is at Trinity College. First of all walk around campus with its grand buildings, green lawns and majestic trees. 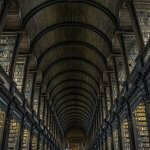 After a quick tour through the mass of people crowding the Book of Cells, I was admiring the authentic Old Library. 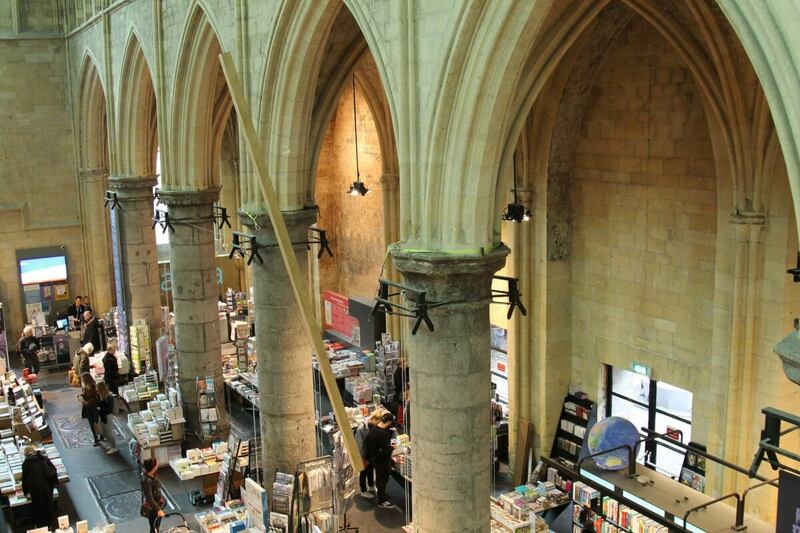 It was truly impressive; books from ground to ceiling. The kind of library of you see in a quintessential BBC detective or a Harry Potter film. An other advantage of having a friend working at Trinity College is that you have access to non- tourist places such as the Common Room; only senior staff is allowed into the classical room with its old-fashioned interior that include Chesterfield sofas and prestigious portraits decorating the wall. 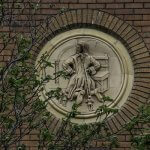 There are rules for those that enter: no undergraduates, no business talk and no use of electronic devices. Violate one of those guidelines and you will find yourself banned from the room! If you want take a break and grab something to eat: around Trinity College, there are lots of pubs and stores. I can personally recommend both Kilkenny Store in Nassau Street and The Porterhouse Central. The former has excellent options for Irish breakfast, lunch and dinner. I truly enjoyed my Irish stew and Shepherd’s Pie. The Porterhouse Central is a pub with a ‘too many to choose from’ beer menu and good food. Both have lovely Irish food for a reasonable price. Like in other cities, Dublin has its share of nice shops and international chains. 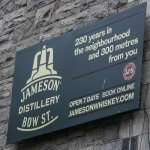 The more original Irish stores you can find in the area between Trinity and St. Stephen’s Green. The posh Grafton Street you should not enter without a wallet filled with lots of cash: Massimo Dutti and Karen Miller are a few brands you can encounter here. Department store Brown Thomas, the Dublin version of Harrods, is truly a sight on its own. Avoca in Suffolk Street has excellent Irish delicacies. 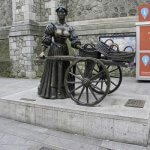 If in need for some Irish luck, you should go to the statue of Molly Malone and rub her breasts. It has never been proven that it brings you luck, but that does not matter to the (mostly male) tourists. I say: stick to the shamrocks and leprechauns. 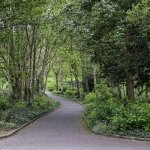 If you need to escape the hustle and bustle of the city, take a walk through the Victorian park St. Stephen’s Green. 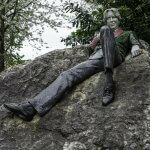 Aside from peace and quiet, you can also find Oscar Wilde’s ‘Fag on a Crag’ statue at the edge of the park. St. Stephen’s Green is surrounded by some of the most beautiful Georgian houses! Talk about authenticity and luxury: enjoy an expensive cup of tea at the Lord Mayor’s Lounge at the luxurious Shelbourne hotel. When you are on your way to St. Stephen’s Green, make a pit stop at Murphy’s for delicious ice cream. There are several flavours such as Irish Coffee and Dingle Gin, but my absolute favorite was Dingle Sea Salt: the perfect combination of sweet and savory. Seeking inspiration for writing a horror story? Go to St. Michan’s Church, for it is said that Bram Stoker’s visit to the catacombs laid the basis for his novel Dracula. The church’s ‘treasures’ lie securely hidden beneath the ground; mummified bodies from the 17th to 19th century. My own horrific experience happened underground surrounded by mummies when a woman took a happy selfie with, as background, three dead bodies. 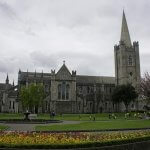 The three most visited historical sites, expect for the Guinness brewery, are: Dublin Castle, Christ Church Cathedral and St. Patrick’s Cathedral. They did not disappoint. Even though Dublin Castle is not really a castle (anymore), it does not make it less impressive. To get the full experience a guided tour is necessary: it provides you with access to all the areas of the castle with the bonus of fascinating anecdotes. 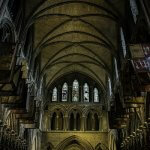 If you experience a sense of déjà vu while wandering through Christ Church Cathedral, this can be explained by the fact that the cathedral was the location of The Tudors and Reign. Next to its beautiful interior, you should definitely descend into the crypt. For a sweet break and royal pastries take a short stroll to Queen of Tarts. The whole store is heaven for people with a sweet tooth; bright colours and delicious scents attack your senses: resistance is futile! Especially the Baileys Cheescake and Blueberry scone were delicious. St. Patrick’s Cathedral was just not breathtaking from the outside, but also the interior leaves you gasping a ‘wow’ when entering. An important element of the cathedral is Jonathan Swift. Aside from being a dean of the church, but the author of Gulliver’s Travels is also buried there. Fun fact: Guinness beer saved St. Patrick’s Cathedral. The grandson of the brewer was responsible for the immense 19th-century renovation. Remnants of the struggle for Irish independence are still tangible at Kilmainham Gaol. 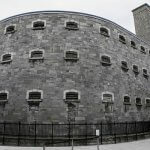 The prison museum lies outside of Dublin centre and during our walk to the museum my friend and I discussed the atmosphere of the neighbourhood. We decided on a certain sadness and hopelessness. Kilmainham Gaol really needs to be visited with a guide. What I noticed during the tour were the ever present emotions when she talked about the strife for an independent republic. With me, there were lots of people affected when our guide recited a poem from one of the executed 1916 Easter Rising leaders on the spot where he was shot. One word: impressive. Across the street, you will find the Irish Museum of Modern Art. The building and its gardens reminded me of Versailles, but the exhibitions did not excite me. Perhaps because I had expected an exhibit on Sigmund Freud and not his father-hating son, Lucian. 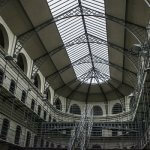 • Kilmainham Gaol: Visit the site were many Irish criminals and rebels met their fate. Significant piece of Dublin history of Independence. • St. Michan’s Church: Well preserved mummified bodies. Bram Stoker’s inspiration for Dracula. The horror! 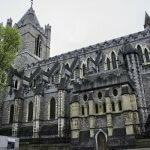 • Christ Church Cathedral: Impressive from both the out- and inside. Do not forget to descent into the crypt. Filming location of both Reign and The Tudors. • St. Patrick’s Cathedral: Huge. Gulliver’s Travels’ Jonathan Swift. Stop and observe the collection of regimental flags hanging on the walls. • Trinity College’s Old Library: I’d say skip the Book of Cells, but since it is historical relevant and you’re paying for it… The real sight is the amazing and authentic library with its wooden ladders, bookcases filled with leather treasures and busts. • Temple Bar: Vibrant, exciting and colourful. Grab a Guinness while chatting to both locals and tourists. 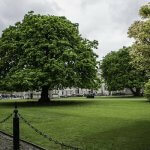 • St. Stephen’s Green: Dublin’s answer to Hyde Park. Smaller, but just as relaxing. 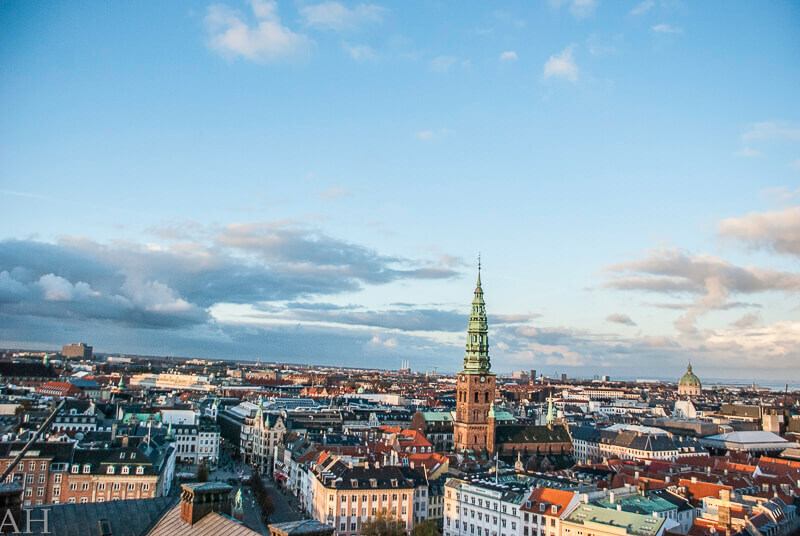 Sit on a bench and read a book like many locals or just walk around enjoying the peace and quiet in the heart of the city centre. 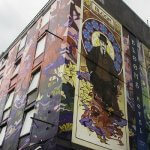 Do say ‘hi’ to Oscar Wilde while you’re there. 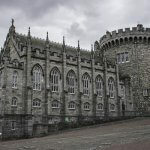 • Trinity College area: Do some (window) shopping and admire the abundance of Dublin history. 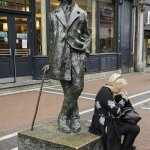 Bump into Oscar Wilde and watch people rub Molly Malone’s cleavage. • Murphy’s: I scream for their Dingle Sea Salt ice cream. • Queen of Tarts: Majestic sweet treats such as their Baileys Cheesecake and Blueberry scone. • Kilkenny Store: Excellent Irish food for a reasonable price. Adored their Shepherd’s Pie. While you’re in the store take a look at the exposed work of local artists. • Avoca: Irish delicacies for ‘to go’ or just take a seat and chat with locals. •The Porterhouse Central: Irish pub food. An ‘oh my God there are too many choices’ beer list. Good food, good prices. Lively and well loved among students. 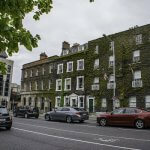 • Shelbourne Hotel: Luxurious and expensive. If only for a cup of tea at the Lord Mayor’s Lounge. My next trip to Dublin will certainly include the coast and a Game of Thrones tour. Stay tuned!